Discussion in 'Guitars in General' started by papersoul, Dec 7, 2016. I don't want to make this an I hate Kirk thread or anything in that direction. I like the tone on the new Metallica album and I see in videos he is playing a burgundy Gibson flying V.
Do you know the specs of this guitar? Is it his signature guitar and are the pickups EMG? I know a lot of pro musicians I see tend to stick with stock Gibson pickups. I know the guy (forget name) from System of a Down uses stock Gibsons, especially SGs, for much of his studio work. I know Carl Bell from Fuel had used EMGs, and guys like Alex Lifeson of Rush, I believe used stock. If that is the Hammett signature he is playing, I will have to look up the specs. Gibson Custom did build some Kirk Hammett Flying V's, I'm not sure what year they were off the top of my head. They had EMG's, I believe an 81 in the bridge, I don't know what the neck was. Most of his signature guitars are made by ESP, and have EMG pickups in them. Kirk always uses EMG's. I set up a KH ESP/LTD for my buddy and I believe it has an 81-81 combo.. I could be wrong. milli vanilli and fishruss like this. Kirk has moved to the 81/60 combo that Hetfield used to use, or at least that's what is in the ESP Kirk signature guitars now. There's some rumbling from people that he's working on his own set of signature EMGs, but nothing official has come out yet. shane8 and fishruss like this. Really, in the new videos, that is an ESP Flying V? 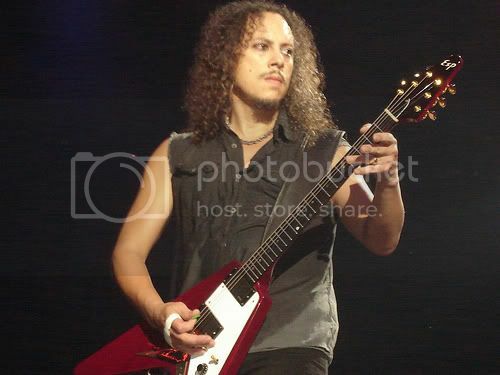 I read in an interview where he said one of his main guitars now is the Gibson Kirk Hammett Flying V with EMGs. It also lists that on a few sites. Gibson has it on their site too. He does use some Gibsons live, and they don't always have EMGS in them. The Gibson KH V was a limited run of 150 and was based on the '79 V that Kirk used in the early days of metalikka. If I remember correctly MAP was $10,000+ on them . Any KH sig guitar worth its salt has a built in wah pedal. grausch, JustinReagin, milli vanilli and 2 others like this. He may have used anything and everything in the studio. My White Zombie is 81/81. That's the one I setup. It's a nice guitar! He seems to favor his mummy ESP quite a bit on the last couple of albums. Hetfield even uses it on the "Kirk" rhythm tracks. halcyon and fishruss like this. In one interview, Kirk said he used his Mummy ESP for all the solos in Death Magnetic since "it sounded the best." fishruss and 27sauce like this. There are both Gibson and ESP red/burgundy Hammett V's. 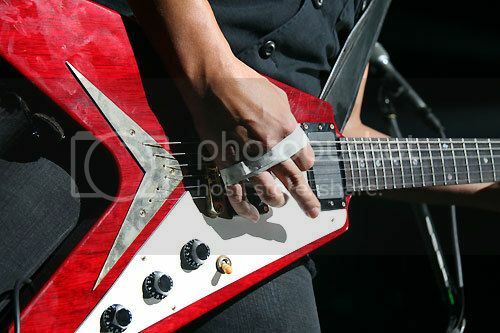 He was using some V's and other different than the norm guitars during the Death Magnetic tour. You don't really see the V anymore live. He's pretty much gone back to using KH-2 style models now. The main ones are The Mummy, White Zombie and he also brought back "Caution" that he didn't use much for awhile. And of course the Peter Green burst. The older guitars have EMG 81's in both positions but his recent ones have the 60 in the neck. Kirk has said that the Mummy is one of those guitars that just has "it". It sounds better than all his other KH-2s and when recording he uses most of the time. White Zombie is said to be right up there and may even be better. Here's my KH-2. I used to have a Ouija model... selling that one hurt. Stev0Griffin and fishruss like this. I don't think the wine red Vs are that old. Pretty sure he got them in the mid 2000's. He had black KH-1s back in the 90's. Yup. Currently it's a dark red Les Paul. Used mostly on songs with cleaner tones. Dude, you sold your Ouija? Nooo! Also, ESP make that mummy sig already.